I thought it was a beautiful thing to say. I knew exactly what he meant. It is what I have always loved about riding a bike. 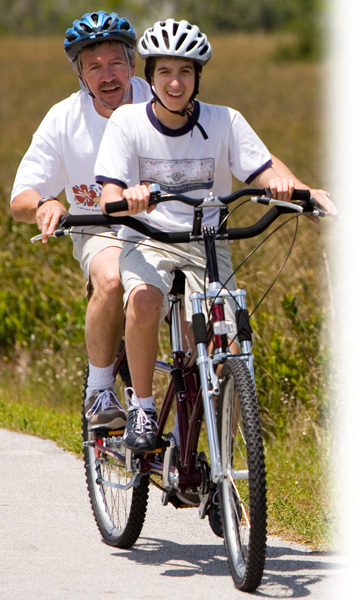 I love that the Buddy Bike is giving us these opportunities to be together, work together, play together, talk together and …..that part about riding a little bit fast so that the wind goes by and makes it cool out – right on your face….it’s the greatest. The Buddy Bike is doing so much more for us than just getting us around town on a bike. My son realizes that this bike is special and that WE are doing something special when we are able to ride it together. Something else happened in this past week that is definitely connected to our Buddy Bike. My son goes to an after school day care program for a couple hours after school gets out until I get off work. He generally has a little bit of homework every day (but generally has to be told to do it and usually doesn’t want to start it unless I am there to help him). I walked into the daycare and there is Kenny sitting at a table by himself with his book bag and homework folder out. I glance down and he already has his whole math worksheet completed and is well on his way toward having his spelling work done. The MORE FUN TIME he is referring to is having more time for us to get out on our Buddy Bike. This bike is just giving him so many side benefits right now that I am amazed. His self esteem is improving and he wants to help me get chores done around the house so that I feel like we have more time to ride, and DOING his homework on his own without being told and trying to do as much of it as he can do independently without someone helping him...we are forming a consistent pattern of getting some exercise most days of the week, and it is ENJOYABLE exercise for both of us. The bonding, the cooperation and sense of working together heading in the same direction on things both on and off the bike is so beneficial to both of us. WE are hooked and probably will be for a long time.